The disc-shaped, 577-kg (1,272 lb) Schiaparelli probe, part of the Russian-European ExoMarsprogramme to search for evidence of life on Mars, descended on Wednesday to test technologies for a rover that scientists hope to send to the surface of the planet in 2020. “Schiaparelli reached the ground with a velocity that was much higher than it should have been, several hundred kilometres per hour, and was then unfortunately destroyed by the impact,” ExoMars Flight Director Michel Denis told Reuters TV. 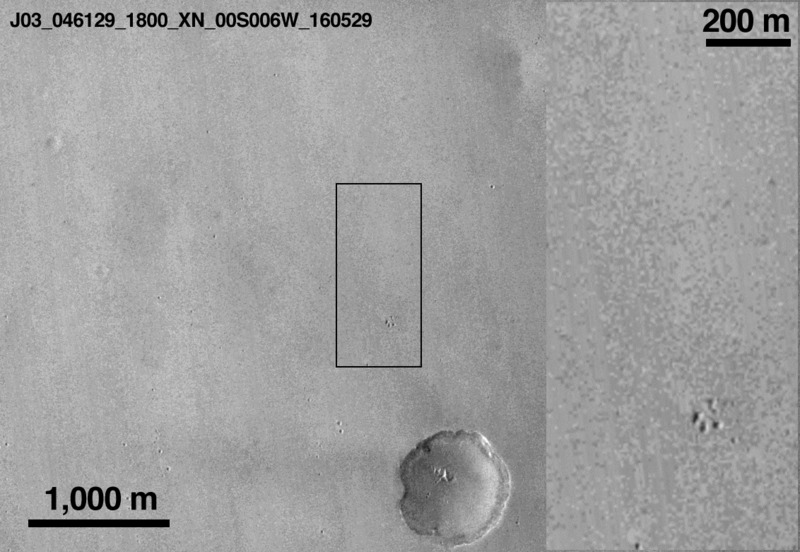 It was only the second European attempt to land a craft on Mars, after a failed mission by the British landing craft Beagle 2 in 2003.The US space agency’s Mars Reconnaissance Orbiter, which has been circling the planet for about 10 years, took low-resolution pictures that show a bright spot that ESA believes is the 12-metre parachute that Schiaparelli used to slow down. They also show a fuzzy dark patch, around 15 by 40 metres in size, about 1 km north of the parachute, which scientists interpret as having been created by the impact of the lander following a longer-than-planned free fall. ESA said it was possible that Schiaparelli’s landing was accompanied by an explosion, as its thrusters’ fuel tanks were probably still full. The primary part of the ExoMars mission has, however, been a success so far, as the Schiaparelli lander’s mothership has been brought into orbit around Mars, from where it will try to sniff out methane and other gases that might indicate the presence of life. It will also act as a data relay station for the rover, which is due to follow in 2020. Landing on Mars, Earth’s neighbour and at its closest some 35 million miles (56 million km) away, is a notoriously difficult task that has thwarted most Russian efforts and given NASA trouble as well. That has not diminished its allure, with US President Barack Obama recently highlighting his pledge to send people to the surface by the 2030s. Entrepreneur Elon Musk’s SpaceX is developing a massive rocket and capsule to transport large numbers of people and cargo to Mars with the ultimate goal of colonising the planet. ESA scientists have been poring over data that the Schiaparelli lander transmitted before its signal was lost, to look for clues as to what happened. They found that a heat shield and parachute intended to slow the craft down from a speed of 21,000 km per hour deployed as expected. “But somehow the parachute was released a bit too early, and after that the engine functioned, but only for a few seconds, which was too little,” ESA’s Denis said. The space agency said that NASA’s orbiter would take pictures with its highest-resolution camera next week, which may provide further clues. ESA Director General Jan Woerner said earlier that the ExoMars mission had been “96 percent” successful so far, despite problems with the lander, as the orbiter was functioning well and the experience with Schiaparelli would still provide valuable lessons for future attempts to land on Mars.